Ah yeah, The Aftermath are finally revving up for the release of album number two! The albums first single, Lost Possession, which was formally / informally released last year will now get the whole nine yards this month with the release of an official video and a launch gig happening in Mullingar. 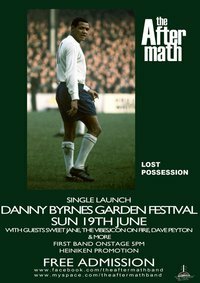 This entry was posted on June 4, 2011 at 4:32 pm and is filed under Gig Listing, IRISH NOISE!, Music, News with tags Danny Byrnes Music Festival, Lost Possession, Mullingar, Sweet Jane, The Aftermath. You can follow any responses to this entry through the RSS 2.0 feed. You can leave a response, or trackback from your own site.